Made in the tradition of an old world bristle brush with a modern twist by utilizing only the best quality synthetic bristle filaments that taper with the natural curve of an interlocking natural bristle. * These extremely durable and strong synthetic bristles brushes are excellent for heavy body acrylics oils caseins and water-soluble oils and are ideal for moving large amounts of color in bold strokes or for working with thickening mediums. * Brushes maintain shape and stiffness particularly in water. 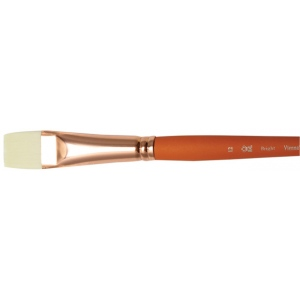 * Features copper-plated brass ferrules and SilkTouch handles.